My previous post described running an automated exome pipeline using CloudBioLinux and CloudMan, and generated incredibly useful feedback. Comments and e-mails pointed out potential points of confusion for new users deploying the process on custom data. I also had the chance to get hands on with researchers running CloudBioLinux and CloudMan during the AWS Genomics Event (talk slides are available). BioCloudCentral — A web service that launches CloudBioLinux and CloudMan clusters on Amazon Web Services hardware. This removes all of the manual steps involved in setting up security groups and launching a CloudBioLinux instance. A user only needs to sign up for an AWS account; BioCloudCentral takes care of everything else. A custom Galaxy integrated front-end to next-generation sequencing pipelines. A jQuery UI wizard interface manages the intake of sequences and specification of parameters. It runs an automated backend processing pipeline with the structured input data, uploading results into Galaxy data libraries for additional analysis. Special thanks are due to Enis Afgan for his help building these tools. He provided his boto expertise to the BioCloudCentral Amazon interaction, and generalized CloudMan to support the additional flexibility and automation on display here. This post describes using these tools to start a CloudMan instance, create an SGE cluster and run a distributed variant calling analysis, all from the browser. The behind the scene details described earlier are available: the piepline uses a CloudBioLinux image containing a wide variety of bioinformatics software and you can use ssh or an NX graphical client to connect to the instance. This is the unique approach behind CloudBioLinux and CloudMan: they provide an open framework for building automated, easy-to-use workflows. To get started, sign up for an Amazon Web services account. This gives you access to on demand computing where you pay per hour of usage. Once signed up, you will need your Access Key ID and Secret Access Key from the Amazon security credentials page. With these, navigate to BioCloudCentral and fill out the simple entry form. In addition to your access credentials, enter your choice of a name used to identify the cluster, and your choice of password to access the CloudMan web interface and the cluster itself via ssh or NX. Clicking submit launches a CloudBioLinux server on Amazon. Be careful, since you are now paying per hour for your machine; remember to shut it down when finished. Before leaving the monitoring page, you want to download a pre-formatted user-data file; this allows you to later start the same CloudMan instance directly from the Amazon web services console. This shared instance contains the custom Galaxy interface we will use, along with FASTQ sequence files for demonstration purposes. CloudMan will start up the filesystem, SGE, PostgreSQL and Galaxy. Once launched, you can use the CloudMan interface to add additional machines to your cluster for processing. The Galaxy interface builds a configuration file describing the parameters and inputs, and submits this to the backend analysis server. This server kicks off processing, distributing the analysis across the SGE cluster. For the test data, processing will take approximately 4 hours on a cluster with a single additional work node (Large instance type). As a reminder, don’t forget to terminate your cluster when finished. You can do this either from the CloudMan web interface or the Amazon console. The pipeline framework design is general, allowing incorporation of alternative aligners or variant calling algorithms. We hope that in addition to being directly useful, this framework can fit within the work environments of other developers. The flexible toolkit used is: CloudBioLinux with open source bioinformatics libraries, CloudMan with a managed SGE cluster, Galaxy with a custom pipeline interface, and finally Python to parallelize and manage the processing. We invite you to fork and extend any of the different components. Thank you again to everyone for the amazing feedback on the analysis pipeline and CloudBioLinux. Improvements in next-generation sequencing technology are leading to ever increasing amounts of sequencing data. With this additional throughput comes the demand for algorithms and approaches that can easily scale. Hadoop offers an open source framework for batch processing large files. 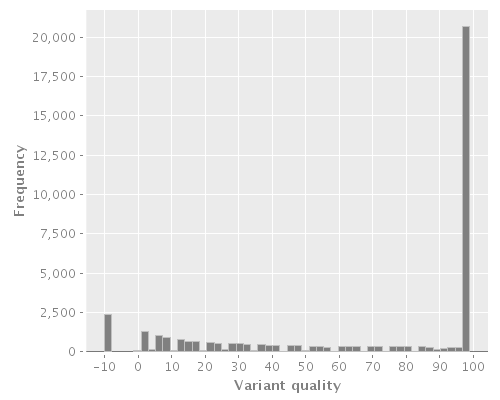 This post describes using Cascalog, a Hadoop query language written in Clojure, to investigate quality statistics for variant calling in deeply sequenced regions. Quality score — The sequencing technology’s assessment of the correctness of a base. K-mer score — An estimate of the uniqueness of the region surrounding the base call position, built using khmer. Unique regions are more likely to be sequencing artifacts, while common regions are more likely to be real. Mapping score — The aligner’s estimate of the reliability of the read alignment. We wanted to generate summary statistics at each position of interest, and look for additional criteria that could be built into the calling algorithm. Cascalog is based on the Datalog rule language, a subset of Prolog. You describe the rules of a system and the query optimizer figures out how best to satisfy them; it requires a change of mindset from the more standard approach that you need to write detailed instructions about what to do. Cascalog provides a high level of abstraction over Hadoop and Map-Reduce, so you focus entirely on writing the query. This post from Antonio Piccolboni compares several Hadoop languages; the post provides a nice side-by-side example of the brevity you can achieve with Cascalog. Cascalog provided an easy to use abstraction on top of Hadoop, which enabled exploration of densely mapped next-generation sequencing reads for variant detection. The code is free of scaling specific details, and instead focuses purely on the data of interest. Another example of Cascalog in a biological setting is the answer I wrote to Pierre’s question on BioStar, dealing with overlapping genomic segments within Hadoop. The code is available from GitHub as an additional starting point for getting oriented with Hadoop and Cascalog. I’ve recently moved positions to the bioinformatics core at Harvard School of Public Health. It’s a great place to do science, with plenty of researchers doing interesting work and actively looking for bioinformatics collaborators. The team, working alongside members of the Hide Lab, is passionate about open source work. Both qualities made it a great fit for my interests and experience. My new group is currently hiring bioinformatics researchers. The work involves interacting collaboratively with a research group to understand their biological problem, creatively attacking the mountains of data underlying the research question, and presenting the results back in an intuitive fashion. On the programming side, it’s an opportunity to combine existing published toolkits with your own custom algorithms and approaches. On the biology side, you should be passionate and interested in thinking of novel ways to advance our understanding of the problems. Practically, all of this work will involve a wide range of technologies and approaches; I expect plenty of next-generation sequencing data and lots of learning about the best ways to scale analyses. Our other goal is to build re-usable tools for the larger research community. We work extensively with analysis frameworks like Galaxy and open standards like ISA-Tab. We hope to extract the common parts from disparate experiments to build abstractions that help get new analyses done quicker. Tool building also involves automating and deploying analysis pipelines in a way that allows biologists to run them directly. By democratizing analyses and presenting results to researchers at a high level they can directly interact with, science is accelerated and the world becomes an awesomer place. So if you enjoy the work I write about here, and have always secretly wanted to sit in an office right next to me, now is your big chance (no stalkers, please). If this sounds of interest, please get in touch and I’d be happy to pass along more details. One challenge with moving analysis pipelines to cloud resources like Amazon EC2 is figuring out the logistics of transferring files. Biological data is big; with the rapid adoption of new machines like the HiSeq and decreasing sequencing costs, the data transfer question isn’t going away soon. The use of Amazon in bioinformatics was brought up during a recent discussion on the BioStar question answer site. Deepak’s answer highlighted the role of parallelizing uploads and downloads to ease this transfer burden. Here I describe a method to improve upload speed by splitting over multiple processing cores. Amazon Simple Storage System (S3) provides relatively inexpensive cloud storage with their reduced redundancy storage option. S3, and all of Amazon’s cloud services, are accessible directly from Python using boto. By using boto’s multipart upload support, coupled with Python’s built in multiprocessing module, I’ll demonstrate maximizing transfer speeds to make uploading data less painful. The script is available from GitHub and requires the latest boto from GitHub (2.0b5 or better). The multiprocessing aspect is managed using a contextmanager. The initial multiprocessing pool is setup, using a specified number of cores, and configured to allow keyboard interrupts. We then return a lazy map function (imap) which can be used just like Python’s standard map. This transparently divides the function calls for each file part over all available cores. Finally, the pool is cleaned up when the map is finished running. Last post we discussed extracting differentially expressed genes from a set of short read data. The output of this analysis is a large list of genes, and the next challenge is to try and extract interesting patterns from the results. Are genes in particular families over-represented? Are there a large number of genes with a particular function? These patterns can help direct your future experiments and provide an understandable grouping for biologists examining the data. The Gene Ontology (GO) project provides a standardized set of terms describing the molecular function of genes. We will use the topGO package from the Bioconductor project to identify over-represented GO terms from a set of differentially expressed genes. Python will be used to prepare the data, utilizing rpy2 to call R for the statistical analysis. The first step is to parse input files describing the differentially expressed genes and the mapping of gene names to GO terms. For the example we will use a simple CSV file from our previous analysis and an equally simple file describing the gene to GO mapping. For real life work, you will need to get the GO mapping file for your organism; for instance, here is the Arabidopsis GO mapping from TAIR. ontology — the type of GO ontology to analyze; molecular function (MF) is examined here. annot — how the GO terms are annotated; we specify they will be identified by a mapping of genes to GO ids, passed as the gene2GO argument. geneSelectionFun — the function we defined above to determine if genes are differentially expressed. allGenes — an R named vector where the names are genes and the values are p-values; we use a utility function to convert a python dictionary to the named vector. gene2GO — an R named vector mapping gene names to associated GO terms. """Call R to create a named vector from an input dictionary. One tricky part of the post-analysis processing is finding all of the genes associated with an identified GO id. The GO terminology is hierarchical, so a resulting GO identifier like GO:0042578 in the example results file can represent both that term and more specific terms. A nice way to illustrate this for yourself is to look at the AmiGO browser display for the term. The full script pulls all of this code together into a working example. You will need to update the parsers to match your input and GO mapping file, but otherwise the code can plug directly into full genome analyses of differential expression data.